VAT shall be added to prices once product(s) enter the Shopping cart. Children’s clothing is not VAT applicable. Description: Men's White Crew Neck Graphic Print Athletic Vibe T-shirt. Description: Men's Black Crew Neck Graphic Print Athletic Vibe T-shirt. Description: Men’s Under Armour ‘Tag’ T shirt. Features an Under Armour logo on the front chest, back neck and side sleeve. Description: Men’s Under Armour ‘Tech’ T shirt. Features an Under Armour logo on the front chest and back neck. Description: Men’s Under Armour ‘Tech’ long sleeve top. Features an Under Armour logo on the front chest and back neck. Description: Men’s Under Armour ‘Swyft’ T shirt. Features an Under Armour logo on the front chest and back neck, as well as a mesh pattern on the back and shoulders. Description: Men’s Under Armour ‘Threadborne Mesh’ T shirt. Features an Under Armour logo on the front chest and back neck. Description: Men’s Under Armour ‘Tech’ T shirt. Features an Under Armour logo on the front chest. Description: Men’s Under Armour ‘Team Issue Wordmark’ T shirt. Features an Under Armour logo printed across the front chest. Description: Men's Red Crew Neck Under Armour Tech Tee. Description: Men's White Under Armour Tech T-shirt. Description: Men's Orange Magma Under Armour Crew Neck Threadborne Streaker T-shirt. Description: Men's Grey Charge Cotton Crew Neck Logo Under Armour T-shirt. 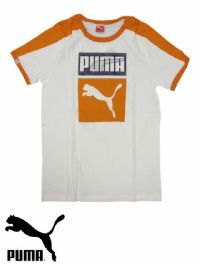 Description: Men’s Reebok ‘Graphic’ T shirt. Features a large 'R' Reebok graphics on the front. Also has the Reebok logo on the back neck. Description: Men’s Adidas ‘Condivo 16’ jersey T shirt. Features an Adidas logo on the front chest, as well as three stripes down each side and made using ‘ClimaCool’ fabric. 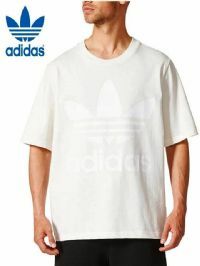 Description: Men’s Adidas Originals ‘AC Boxy’ T shirt. Features an Adidas Originals Trefoil logo printed across the front. Description: Men’s Adidas ‘M Response’ T shirt. Features an Adidas logo on the chest and has the three stripes on the side sleeves. 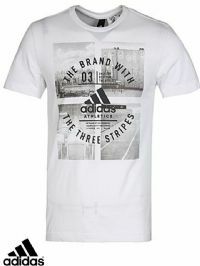 Description: Men's Adidas White Graphic Print T-shirt. Description: Men's Navy Timberland Crew Neck T-shirt with White outline logo text.